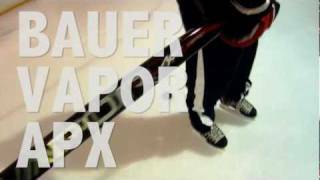 The Bauer APX stick is the latest and greatest Bauer hockey stick out there, with an emphasis on `greatest.` This is the perfect storm of new stick technology, the best of Bauer`s previous stick technology and a sick look-and-feel! The APX stick is ideal for the crafty player that excels in puck handling and quick-release shots. The foams in the blade are a combination of the much heralded TotalOne and the X:60 and the dual kick points remain intact. The main difference and enhancement here is the new make up of the shaft, which will make it much more durable. You can see all the detail in the Overview tab below, but know that this thing is loaded - and your shot will be, too! Weight: 335 Grams Weight of the product measured in grams. Construction Material: Lightweight TeXtreme Carbon Composite Type of material the product is made of. Kick Point Position: Intelli-Sense Dual Flex Points Inflection point where maximum stored energy is released. Shaft Design: Micro Feel II-Rounded Corners/Concave Walls Shape of the shaft edge. 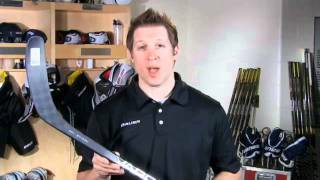 Blade Construction: Full Composite w/Dual Density Blade Core Type of material the blade is made of.